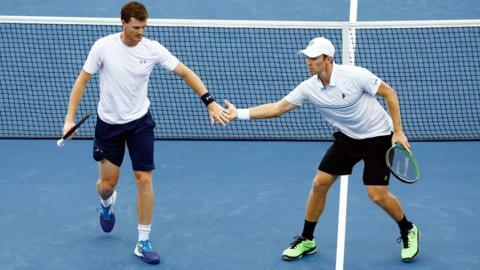 Britain's Jamie Murray has made it into the US Open doubles final with his partner John Peers. They saved a match point to beat Americans Steve Johnson and Sam Querrey in three sets - 6-4, 6-7, 7-6. The duo have reached their second Grand Slam final in a row after making it to the Wimbledon finals in July. "My nerves are shot but we're so happy to win and get to the final," said Murray. "We played a very high level match and the other guys were serving really well but we managed to turn it around." They will now face Pierre-Hugues Herbert and Nicolas Mahut from France in the final at Flushing Meadows in New York. Jamie's younger brother Andy sent a message of congratulations to the pair on social media. He wrote on Twitter, "So proud of my big brother @jamie-murray and his partner @johnwpeers! Us open final... Great job guys.. Amazing win."